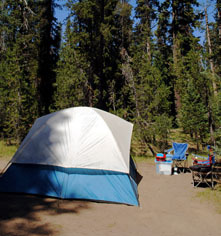 Mazama Village Campground is located near Highway 62 at the Annie Springs entrance. They offer 211 Tent and RV sites, accommodating Tents up to 12’ x 12’ and RVs up to 50 feet in length from mid-June through early-October. Lost Creek Campground, located three miles off the East Rim Drive, is more secluded. It has 16 campsites for tents only, cold water faucets, and toilet facilities. Lost Creek is open from mid-July through mid-September. Backcountry camping is also permitted with a permit. 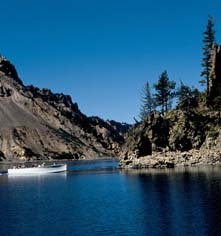 Visit craterlakelodges.com for more information. From early July to mid-September dependent upon weather conditions, guests can enjoy a tour of Crater Lake onboard Volcano Boat Cruises. The tours depart at Cleetwood Cove and are approximately one hour and 45 minutes. An Interpretative Ranger from the National Park Service will be onboard the boat and offer cultural and natural history about Crater Lake. All guests will remain on the boat for the entire tour, making stops at some special points along the way to view the beauty and formations of Crater Lake, including Wizard Island and Phantom Ship. Crate Lake Lodge also offer tours to Wizard Island, where guests can be dropped off to enjoy additional hiking, exploration, and take in the beauty of the area. Please note there is a 1.1 mile hike with a 700-foot accent in elevation to and from Cleetwood Cove. Due to the strenuous nature of the hiking requirements to access the boat dock, this tour is not recommended for anyone with medical or physical problems that may limit them from this exertion. Visit Volcano Boat Cruises for more information. Crater Lake contains more than 90 miles of hiking trails, ranging from easy to strenuous. Many of these trails may be hiked in a single day. Additionally, 33 miles of the Pacific Crest Trail pass through the park, offering hikers magnificent views of the lake. Hikers who wish to camp overnight in Crater Lake National Park must get a backcountry permit. Kokanee Salmon and Rainbow Trout are both present in Crater Lake. 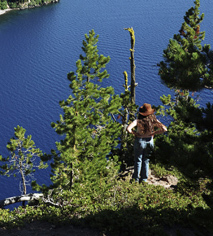 No fishing license is required within the boundaries of Crater Lake National Park. The lake can be fished year-round except when weather prevents safe access. The only access to the lake is by the Cleetwood Trail located on the north side of Crater Lake. Cleetwood Cove provides about a quarter mile of rocky shoreline for angling. Wizard Island is also open while boat tours are running. All waters are restricted to the use of artificial lures and flies. Crater Lake is available for certified scuba divers. Permits are not required. Lake access requires a hike down Cleetwood Trail. Guests must be able to carry all of their equipment up and down the trail.